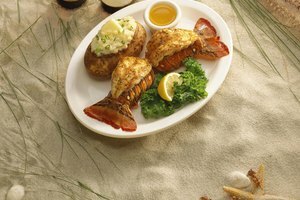 Your crab feast tastes even better than usual if you cook the crabs at home. While the crabs boil on your stove top, you get to enjoy the salty, briny, crab aromas permeating the kitchen. Cutting the crusty French bread, preparing the butter sauce or tomato-based cocktail sauce and spreading newspaper on the table all become anticipatory pleasures while crabs are cooking. If you can, keep the crabs alive in an ice chest or tub before cooking. That way they remain as fresh as possible. Cover them with a towel or burlap, and place a thick layer of ice on top. 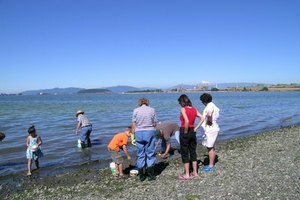 Your goal is to keep the shellfish moist and able to breath, but not submerged in water. 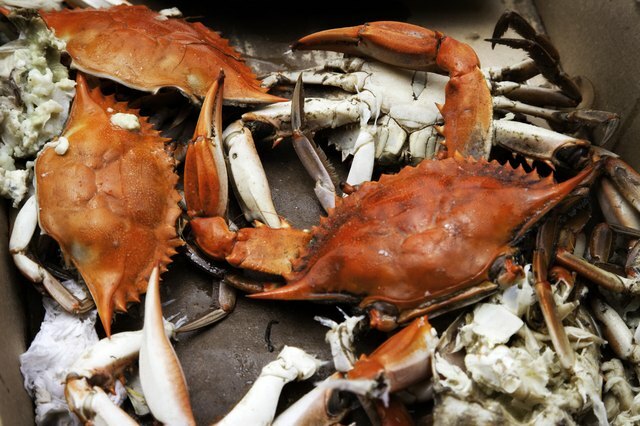 Crabs deteriorate quickly once they die, but they remain alive for up to two days if handled carefully. In the fridge, live crabs stay alive up to 12 hours. 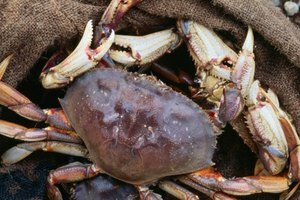 You have a choice when it comes to cleaning crab: either before or after cooking. If you are squeamish, cook the critters first. That way there's no chance of your needing to kill the crabs with a hammer-blow to the abdomen before cleaning. Cooking raw crabs involves no cleaning at all. Just drop them into the pot, grabbing live ones from the back to avoid getting pinched. To avoid finding out at the last minute that your crabs won't fit in the pot, try them out ahead of time when you first get them home. You'll need enough room for the creatures to all be covered by 2 to 3 inches of water, with 3 to 4 inches of space at the top of the pot to allow the water to boil freely. Most of the work in cleaning uses just your fingers, but you also need a mallet or hammer and a wooden cutting board to crack the shell on the legs and claws. For uncleaned crabs, bring a pot of water, salted with about 1/4 cup of salt for each gallon of water, to a full boil. Drop in the crabs head first if they're still alive. Bring the water to a boil again, and cook for 15 to 20 minutes. When they're done, drain them and rinse them under cold water until you can handle them easily. Cleaned crabs need only 12 minutes of boiling in water that is half as salty. Putting on an apron or tying a sheet around you is a necessary precaution if you don't want the aroma of your clothes to remind you of your meal. Whether you clean the crabs before or after cooking, first remove the flap of shell on the underside, and then remove the top shell on the back by inserting your thumb underneath and pulling firmly. Remove all the gills from either side underneath the shell, and break off the mouth parts. Then, hold the crab under running water and completely rinse out all the greenish-brown guts. Next, put your thumbs in the middle of the crab's back on the underside, and pull the crab apart into two halves. If the crab is still raw, begin cooking at this point. For cooked crabs, pull off any large chunks of meat. Then, twist off the legs and claws, and crack them with a mallet, nutcracker or hammer. One crab typically feeds two people with a high protein, low fat meal of about 4 ounces of crab meat per person, with lots of vitamins, minerals and healthy omega-3 fats. 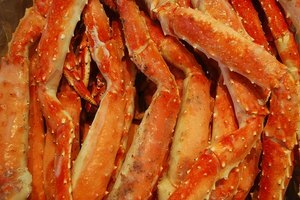 Use the cooked crabs in a sauce for pasta, in crab sandwiches on crusty rolls, or eat them straight with bread and beer to wash it all down.